« Around the World Part IV: France! An encouraging word . . .
As some of you know, my family suffered a tragedy the 7th of September, when my brother-in-law was swimming in Ocean City, Maryland, and suffered a broken neck of the C1 and C2 vertebrae, the same injury as Christopher Reeves. This has rocked our world and turned it upside down, as you can imagine. Currently, things have stabilized, but doctors hold out little hope for Brent to recover any function below his neck, including the ability to breathe on his own. My sister is maintaining courageously, but the daily round of travel, long hospital visits, grim prognosis from doctors, caring for a 14 year-old, two dogs, a home, and financial pressures certainly are a heavy weight upon her. As our family has processed this loss, and the way in which life can turn upside down in a heartbeat, I’ve been meditating on how we as humans deal with crisis. I’ve suffered the full range of emotions, a heavy sense of grief, a feeling of powerlessness, feelings of panic and intense anxiety for my sister and her husband and daughter. I’ve also experienced what they call “survivor’s guilt” and the ways in which guilt can plague those who witness this type of tragedy up close and personal. I haven’t sorted out all these feelings and I’m certain there are more to come. In the meantime, I’m trying to process what it means to walk in the “joy of the Lord” in the midst of tragedy and trauma. I confess I’m not there yet, but am hoping that I can learn through this what Nehemiah meant when he said, “The joy of the Lord is your strength” (8:10). The above verses have taken on a concrete reality for me in the past few days. The stories of heroic individuals, a dear friend who is a quadriplegic, Christopher Reeves, and many other truly courageous individuals who have chosen to face the devastating loss of mobility with courage and grace have brought courage and strength to me. I have felt forlorn and shipwrecked with the overwhelming challenges my sister faces, and how to best help her and Brent. 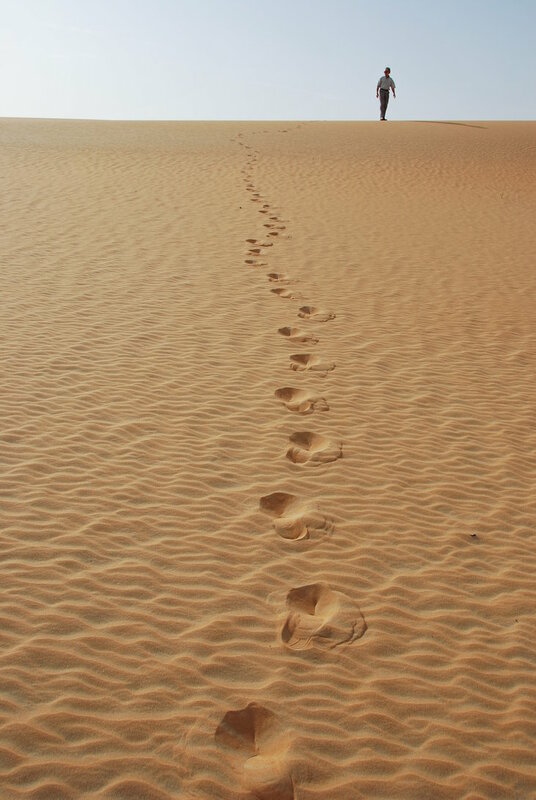 But the stories of those who have walked this same road have enabled me to “take heart again.” I hope that whatever you are facing today can be viewed through the light of the words below, remembering that the choices we make leave footprints for those who follow behind. I hope I can become better at choosing to live life with grace and joy, and watch how God is able to transform tragedy into triumph. As my sister is under tremendous financial pressure, If you feel inclined to help her and her family at this time, you can visit this link. All donations are tax-deductible and 100% of the money will go directly to my sister and husband to pay for daily living expenses. Thank you. I had not heard. My heartfelt prayers go out to all of you. So very sorry for the pain your family is experiencing right now. Please see the link below. Many prayers and God’s blessings to you. I feel your pain and suffering and have compassion for the situation you are in. It grips my heart at times the twists and turns life can take for each one of us and how God can use these twists and turns to pry our hands off of what is temporary and focus on that which is eternal. Only God knows how to move us out of our comfort zone and into a deeper and more profound walk with Him. It is unique for each one of His children. I am strengthened and encouraged by not only the life of Christ but by the Saints that have chosen to serve Him with their lives. Your daily relationship with God will give you the strength to embrace the pain that has been allowed on your sister and her family and your family as well. The Holy Spirit will not fail you in giving your family guidance as to how to assist your sister and her family. You can rest in the knowledge that God will indeed guide you and as you seek Him. Your faith will give you the courage to embrace your sister and her daughter and especially your brother- in- law’s pain. It is after all what the gospel message is all about. As Christ entered into the pain and suffering for our lives in His life on earth you will grow in faith and love and courage as you walk through this trial with your loved ones. You all will be in our daily prayers. God bless you and guide you on the path He would have you go. Be strengthened by His love. Thank you, Cheryl for these very heartfelt words and sentiments. We embrace them and the hope they give us in this situation. God bless you for your heart! I am so sorry this happened to your brother-in-law. My daughter had a spinal cord injury in June 2012. Many told her that she would never walk again. God led us to a place called Project Walk in Carlsbad, CA last spring. Through a lot of hard work and their training, she has recovered quite a bit of function below her point of injury and continues to improve. They do amazing work there and have given us the vision to keep on trying and not accept status quo. You may want to check it out to see if they can help him. Our motto is to never give up, never lose hope. May God give you all the grace and resources needed for each day. Thank you, Laura for this. Your daughter’s story is such an encouragement. I will pass it along to Patty and Brent! God bless you in your journey. I’m so sorry to hear about this situation. I can’t imagine how difficult it must be for all of you. Back when I lived in Denver, I was a Nuggets fan and was thrilled to run into Nuggets player Rodney Rogers at the local supermarket one evening. He seemed awfully patient and understanding when I sheepishly asked him for his autograph. A year or two ago, I wondered about where Rodney had ended up after his stint with the Nuggets, so I googled him and was saddened to learn that he was paralyzed in a dirt bike accident. Why am I writing all this? Because after his life-changing accident, he started a foundation to help others facing the same sorts of issues he’s had to deal with. You can check out The Rodney Rogers Foundation here: http://www.therodneyrogersfoundation.org/ I hope it helps you, your sister, your bother-in-law and their daughter in some way, no matter how small. Thank you, Cheryl for these timely words and for the link to the Rodney Rogers Foundation. I have checked it out and will follow up on that with my sister. I think they could probably help us a lot in dealing with the insurance issues. Another set of “footprints” to follow after those who have “walked” this road! Thank you for your kindness! I’m very sorry. Our family has also known the heart-break of an SCI. Thank you, Suzanne. Your blog post was very helpful to me. I will pass it along to my sister, too. It is so important to have the wise counsel of someone who has been there. Thank you. I’m glad it was helpful. And again, I am so sorry that your family is experiencing this. Hard times indeed. Wonderful blog, perfect poems, heartfelt care for your family. Will pray for peace and wisdom and faith for all, He is what we soooooooooo depend on in these truly difficult days for Brent and Patty. Let me know if I can help in any way. Thank you, Mel. Will take you up on it! Oh Rea, we are sorry to learn of your brother-in-laws’ accident. My heart aches for all of you. Watching your sister/brother in law in this devastating situation is heart wrenching for you. We will lift them in our prayers as well as you and your siblings. Thank you, Alyce for your kindness and prayers. I’ll also check to see what I can find on India!